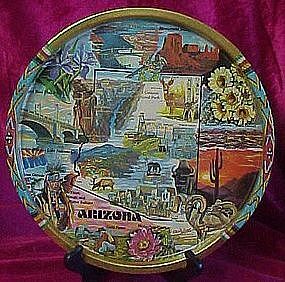 Metal Arizona state tray. Measures 11", goldtone metal, multi colored instead of the standard black, and quite striking. There is a picture of the state flower (saquaro cactus), a map of the state showing many of the key landmarks, such as Grand Canyon, Monument Valley, the painted desert, and lots different attractions. The tray is in excellent condition. A very nice souvenir.